National Security Systems Inc. has chosen Radionics security systems as our primary manufacturer because Radionics has been an industry leader in reliability, flexibility and innovation for over 25 years. Radionics/Bosch Security Systems offers a broad range of security systems ranging from the 2000 Series, 6412 series to the expandable 9000/7000 series, a fully integrated fire, intrusion and access control system. Radionics/Bosch Security Systems can be programmed locally or remotely using Remote Account Manager (RAM), we can program and analyze your Radionics alarm system from our service center saving you time and money. Radionics/Bosch Security Systems control/communicators are compatible with industry standard receivers including the Radionics D6500 and the new D6600. National Security Systems’ product line, offers hardwire, wireless and combination systems, as well as a range of alternate communication options including long range radio. The flexibility of the Radionics/Bosch Security Systems product range provides solutions for all kinds of security applications; large or small, single or multi-building, commercial or residential. For residential applications, Radionics/Bosch Security Systems provides a high level of electronic monitoring and reporting for single-dwelling or multi-dwelling homes. For commercial or government sites, Radionics/Bosch Security Systems offers systems suitable for single structures to multi-building sites. Hardwire or wireless technology options allow economical installation in all applications. The alternate communication options allow system communications for almost any location. This platform includes our entry-level Radionics security systems this platform includes the D2212BE, and the D2212B, Radionics security alarm systems. The Radionics D2212BE security alarm system is a 12 VDC control/communicator with 8 hardwire on-board zones. The Radionics security system can have up to 8 users arm/disarm codes. The Radionics D2212BE is suitable for use with 2-wire smoke detectors and other initiating devices that can be used in Household Fire Warning Equipment Installations (NFPA 72). This Radionics security system is simple to use and suitable for small sized residential or commercial applications. Programmable locally at Keypad, or with Remote Account Manager. The Radionics D2212B security alarm system is a 12 VDC control/communicator with 8 hardwire on-board zones, expandable to 24 points with hardwire and wireless point expansion. The Radionics security system can have up to 8 users arm/disarm codes. The Radionics D2212B is suitable for use with 2-wire smoke detectors and other initiating devices that can be used in Household Fire Warning Equipment Installations (NFPA 72). This Radionics security system is simple to use and suitable for small sized residential or commercial applications. This platform includes our newest product line from Bosch Security Systems, this platform include the D6412 security alarm system. National Security Systems will soon release the D3412 and the D4412 alarm systems and will have update information as soon as it is available. The Radionics D6412 security alarm is a 12 VDC control/communicator with 8 fully supervised on-board points, expandable up to 40 through any combination expansion modules and wireless points. This Radionics D6412 security system can be divided into 4 independent and fully configurable areas for more precise system control. The Radionics D6412 supports up to 32 users arm/disarm codes. Users may also arm and disarm the system and generate Open and Close reports via an RF key fob, which identifies the user without having to enter a pass code. Four programmable authority levels allow for specified system access for each user. Eight programmable skeds (scheduled events) allow the user to arm and disarm the system, or operate various system outputs at a specific time of day and day of the week. This security system l provides four on-board programmable outputs, expandable up to 20. The Radionics D6412 can communicate with analog numeric paging. Data bus modules allow status reporting via alternate communications paths Uplink radios, and LAN/WAN. The event log records up to 255 panel events that can be printed on a standard serial printer. This Radionics security system is simple to use and suitable for medium sized residential or commercial applications. This platform is our high-end product from Bosch Security Systems with the mid-range D7412G and the larger D9412G alarm control panels. This platform provides integrated security alarms, fire alarms, and access control systems. The Radionics D7412G security alarm/access control/fire alarm system is a 12 VDC control/communicator with 8 on-board points expandable to a total of 75, 8 independently functioning areas or account numbers, up to 99 users arm/disarm codes, and an optional local printer. 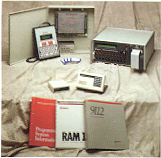 The Radionics D7412G can be configured as a 12/24 volt fire alarm control system, meeting the requirements of the National Fire Protection Association. The Radionics D7412G also has access control capability for up to 2 doors and 396 cards. This system is suitable for medium to large-sized commercial or residential applications. UL Listed. This Radionics security system, fire alarm system and access control system is simple to use and suitable for medium sized residential or commercial applications. This system is compatible with the D1255 and D720 standard keypads the D1255B designer keypad or the new simple to use D1260 and D1260B keypads. 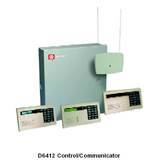 If you are using the D7412G as a fire alarm system you can use the D1256 or D1257 as fire alarm annunciators. This system is so feature packed that we strongly recommend downloading the product specification sheet D7412G. The Radionics D9412G security alarm/access control/fire alarm system is a 12 VDC control/communicator with 8 on-board points expandable to a total of 239, 8 independently functioning areas or account numbers, up to 249 users arm/disarm codes, and an optional local printer. The Radionics D9412G can also be configured as a 12/24 volt fire alarm control system, meeting the requirements of the National Fire Protection Association. The Radionics D9412G also has access control capability for up to 8 doors and 996 cards. This system is suitable for larger commercial or residential applications. UL Listed. This Radionics security system, fire alarm system and access control system is simple to use and suitable for large sized residential or commercial applications. This system is compatible with the D1255 and D720 standard keypads the D1255B designer keypad or the new simple to use D1260 and D1260B keypads. If you are using the D7412G as a fire alarm system you can use the D1256 or D1257 as fire alarm annunciators. This system is so feature packed that we strongly recommend downloading the product specification sheet D9412G. A complete range of command centers and keypads are available for all Radionics intrusion systems. The options include: LED, LCD and vacuum fluorescent displays, flush and surface mount versions, a choice of white or off-white colors, and vertical and horizontal design. A wide range of multi-technology sensors with built-in diagnostics signal status via a 2 or 4-wire multiplex connection to the 9000/7000 Series control panels, producing exceptional system performance. The 9000/7000 Radionics security alarm systems can be easily integrated with the Radionics Readykey access control system to provide a fully functional, integrated security solution. Both the security alarm system, access control system, and the integrated sensors remain fully functional when integrated. This integration capability allows end users to enter the building and automatically disarm their alarm system by simply presenting an electronic ID to a reader. Radionics/Bosch Security Systems provides complete security alarm solutions. Radionics panels cover all types of job requirements from small systems to large detection networks. As an authorized Radionics/Bosch Security Systems dealer, National Security Systems Inc. can help you select a security alarm system to meet all your project and budget needs.